Shackle hanger brackets, spring hanger brackets, spring hanger cross-brace, and hardware. This system allows for relocating your front spring shackles to the rear mount for an improved, more stable ride with less rebound in the front end. No welding is required. 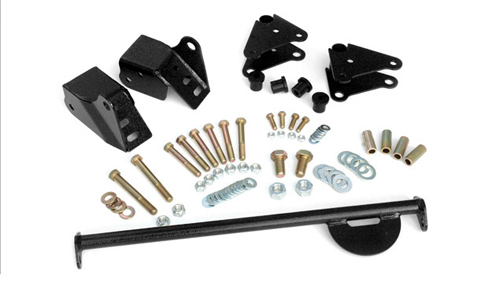 This kit will work for lifted or factory height vehicles, and gives about 1/2" of lift. Improved, more stable ride quality.